We welcome new members who want to learn Kendo or Iaido at any time of year. Classes are held at the Welland Martial Arts Centre, 40 Division St. in Welland. No experience is required. For Kendo, students must be at least 8 years of age to practice. For Iaido, students must be at least 13 years of age. Equipment can be borrowed for the first several classes. The Niagara Kendo Club is run on a not-for-profit basis. All monies received are put towards rent, equipment, and other club expenses. The monthly cost of membership is $40. Due to our special relationship with the Welland Martial Arts Centre, the monthly fee for their club members is $20. For families with two students or more, the first student will be at the regular rate and additional family members will be half price (i.e. $60 / month for a parent/guardian and child or for two children). Every year, there are dues payable to the Canadian Kendo Federation (CKF) and Ontario Kendo Federation (OKF). 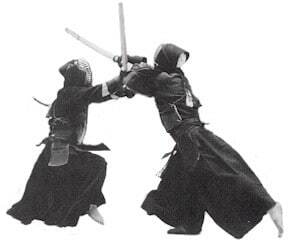 All members of the Niagara Kendo Club must be registered with the CKF and OKF for grading and insurance purposes. The combined federation fees are $40/year for adults and $20/year for students under 16. If you are interested in joining, all you have to do is show up at a practice. However, please call Mark Kawabe at 289-241-3080 or e-mail the club a few days in advance. There may be a special seminar or other event not suitable for first-time students that day so it’s good to confirm you’re coming. Kendo requires an investment in equipment and uniforms, but with the exception of the shinai (bamboo sword), armour (bogu) and uniforms (keiko-gi and hakama) tend to last for years. Expect to pay around $180 for the uniform, a shinai, set of bokuto (wooden swords) and a shinai/bokuto carry bag, shipping and duties included. You do not need to purchase a uniform right away. However, we do encourage all students to purchase a shinai, bokuto set and carry bag once they have committed to join the club. The club has loaner shinai and bokuto in limited quantities. Bogu usually holds its value well so if you ever decide to leave Kendo or upgrade to a new set, you’ll be able to sell it fairly easily. The club has several sets of bogu available for rent for a small monthly fee. If you’re interested in purchasing, a decent starter set of bogu will cost around $450 and should last for many years.